The Pentax Optio NB1000 is a 14.1 megapixel camera with 4x optical Zoom and 720p video recording. Oh, and it's front face is like a Lego board so you can attach anything you want on it. 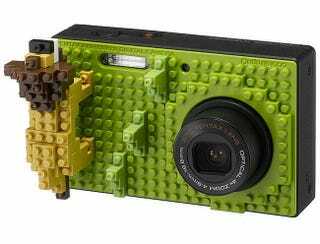 It's actually using Nanoblocks from Japan's DiaBlock (so not exactly Lego) but the idea is the same as Lego's: you throw and snap on building bricks to create anything you want, whether it's adding extra grip with more pieces or constructing a random design. Having a lego board on your camera is borderline crazy but it's fun and adds so much character to your camera. I don't even care how well the NB1000 can take pictures, I'm already sold.